We drove miles and miles of straight, flat Illinois State highways, through a few thunder showers, watching occasional lightning bolts light up the skies above endless fields of young corn stalks, to finally cross the Mississippi River on a high narrow bridge into the city of Dubuque, Iowa about dinner time. 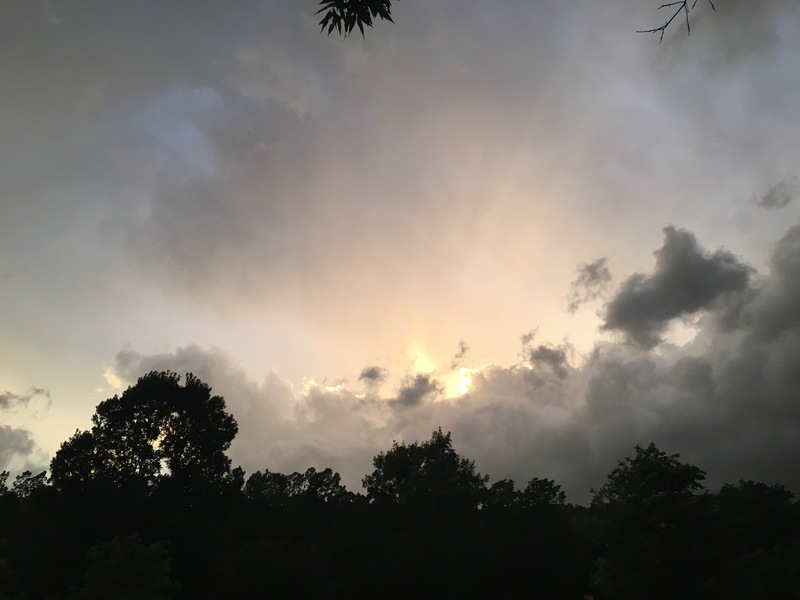 As we settled into our campground in a valley between forested green hills, the sky had the appearance of dusk even though the sun wouldn’t be setting for hours. We went about our evening, making dinner, undertaking the normal stalling-bedtime shenanigans, and we had been so busy with our fun in Chicago that I hadn’t been watching the weather forecast. So I had no idea that a series of tornados had been touching down and causing damage all over Iowa throughout the afternoon. 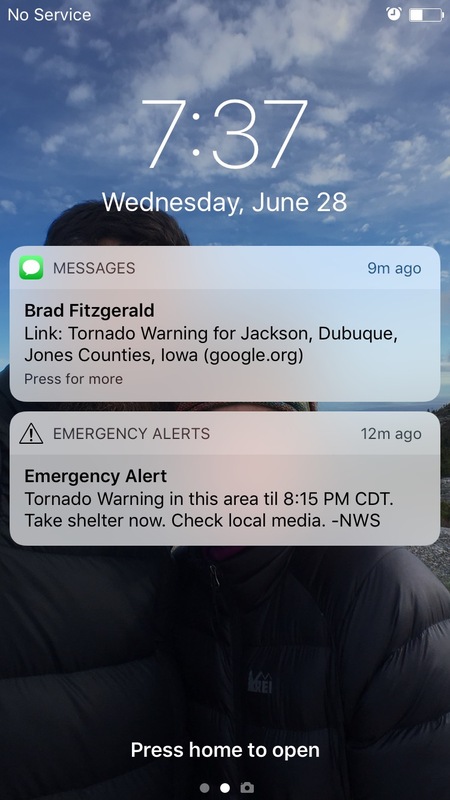 So when both our phones started buzzing with a national weather service alert that our area was under a tornado warning and we should take shelter immediately, we were completely taken off guard. Not my favorite message to receive, but I’m really glad to know that these alerts come to my phone! While Brad got his computer shut down and starting grabbling some books & water & children & shoes, I hurried outside to try to put the canopy away in the strengthening wind. I could heard the Dubuque tornado sirens going off in the distance, and our neighbors told us that the park rangers were directing everyone to the cinderblock bathhouse building. In my nervousness, I completely forgot how the process of retracting the awning is supposed to work, so I did it completely wrong. As I wrestled with it, distracted by my fear, I finally hit the release mechanism without the tether in my hand, so the entire awning went rolling up toward the camper wall at full speed and wound itself up into the closed position with an enormous SLAP! against the side of Stumbo. “Well…that’s one way to do it,” Brad teased as he and the girls made their way outside. I grabbed the picnic blanket in case we ended up sitting on bathroom floors for hours, and my ukulele in case our group needed some cheer. I have to mention that I grew up in tornado alley in northwest Arkansas, so I’m no stranger to tornado watches. Most of the time my parents would keep the weather forecasters on during the frequent evening summer thunderstorms, or the NWS alerts would interrupt our evening sitcoms to warn us that potential twisters were in or area. But my family was more of the “sit on the porch to watch the storms roll in” kind of people than the “hide in the bathtub with a mattress on top of you” kind of people. I think that maybe the philosophy was, “If one hits the house I’d rather die in bed than in the bathtub,” but I’m not sure. They also laughed about the fact that our downstairs interior bathroom, arguably the safest place to shelter during a tornado, was situated directly below our giant, heavy, upstairs piano, so maybe that wasn’t the best place to hide, mattress or no. Regardless, the way my parents comforted me during the frequent tornado watches was to say things like, “Oh the only people who have to really worry about it are people who live in mobile homes or trailers.” Needless to say, that is of little comfort to me now! 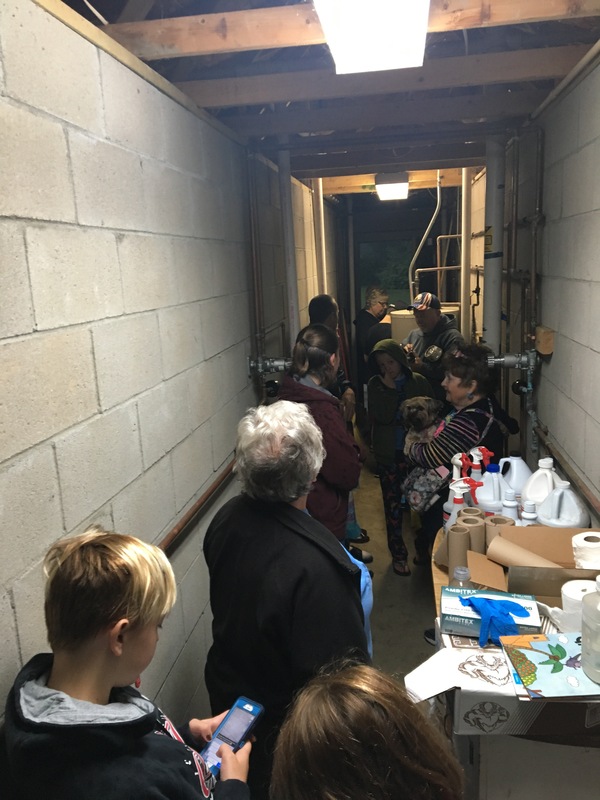 The supply hallway in between the men’s and women’s restrooms was the designated storm shelter, and about 2 dozen people stood inside, several holding small dogs, and many watching weather radars on their phones. A tornado had touched down in a small town southwest of us called Praireburg, and the storm was headed our way. We took shelter about 7:50, and the worst was supposed to be over by 8:15, so we didn’t have long to wait. Our family was all the way at the back of the hallway, and the girls settled onto a bin of tools and extra toilet paper to listen to Brad read a chapter from Goonie Bird Green, their latest bedtime book by Lois Lowry. There were quite a few kids sitting on the floor, so I took out my uke and we sang “You Are My Sunshine” and “Happy & You Know It” and some other songs on a list of summer VBS songs that I had in my instrument case. 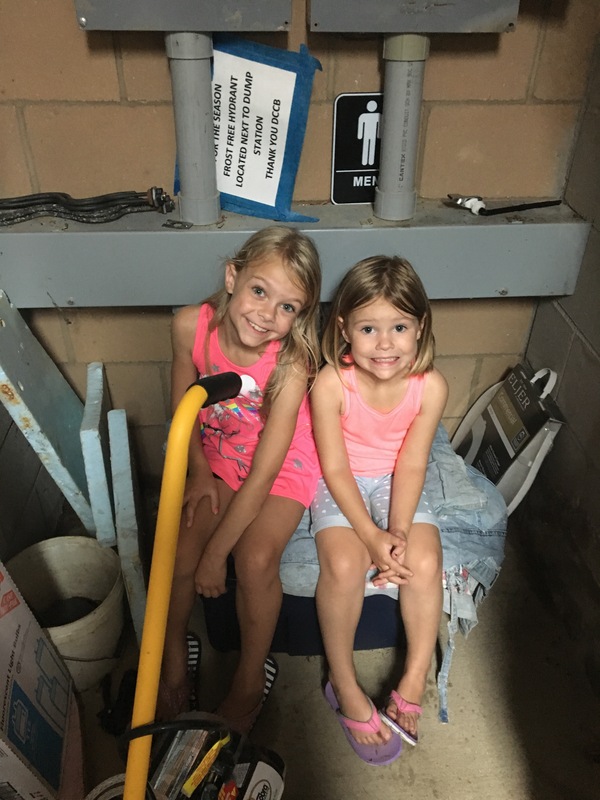 Happy little storm shelter kids. Once it was all over, we had been joined by about twice this many people in the hallway. 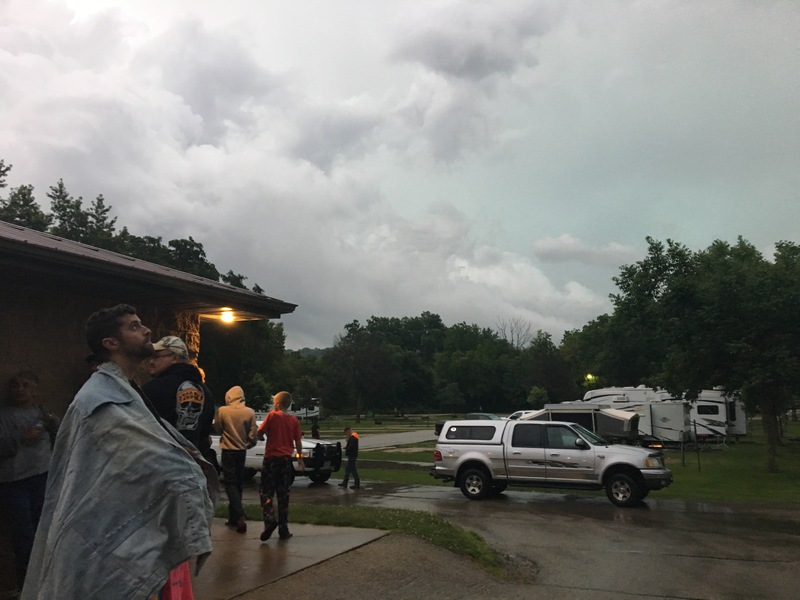 Everyone slowly made their way out of the shelter once the storm had passed, watching the turbulent but beautiful skies. It’s amazing what a little bit of fear can do to make a bunch of strangers feel like friends. Once the green skies cleared as the storm passed, the sun began to shine out gloriously from behind puffy clouds. 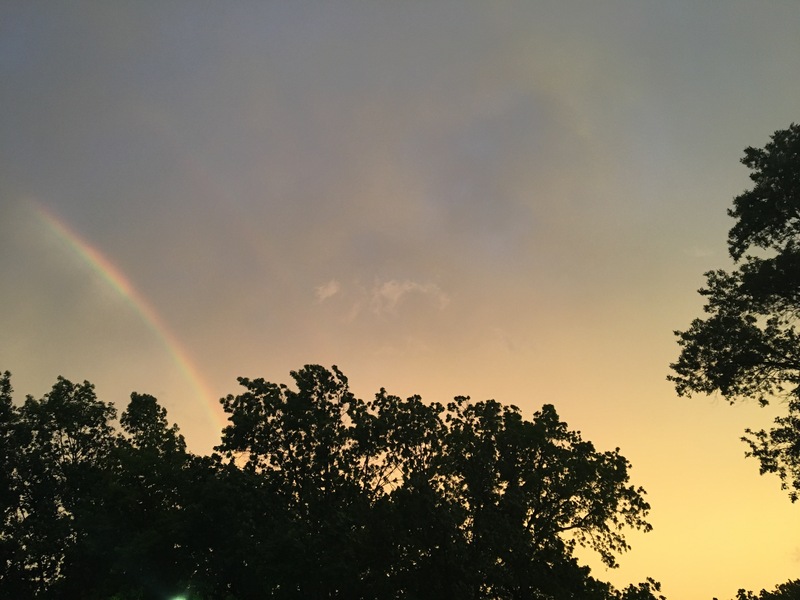 The view of the skies as we stepped back into Stumbo after the storm. 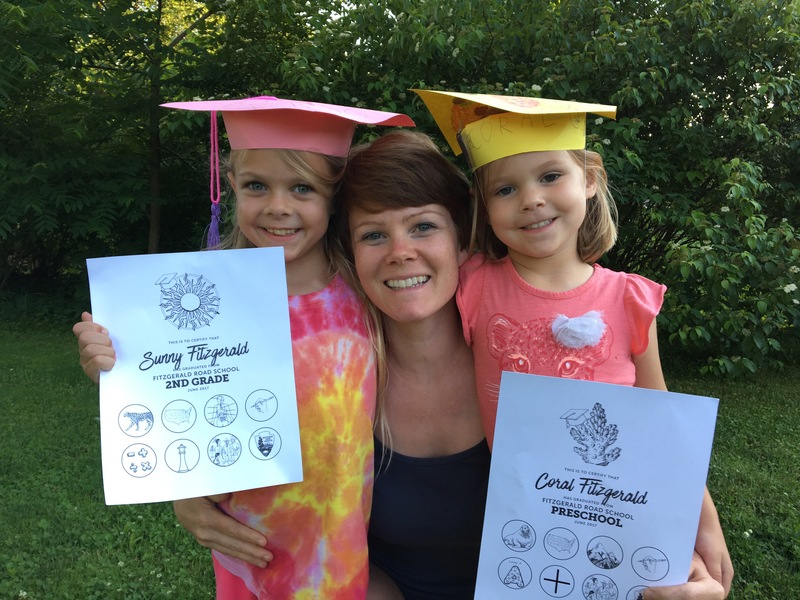 The other memorable moments from our time in Iowa were that we celebrated the end of the school year with diplomas, “Pomp & Circumstance” on repeat, construction paper grad hats, and brownies. 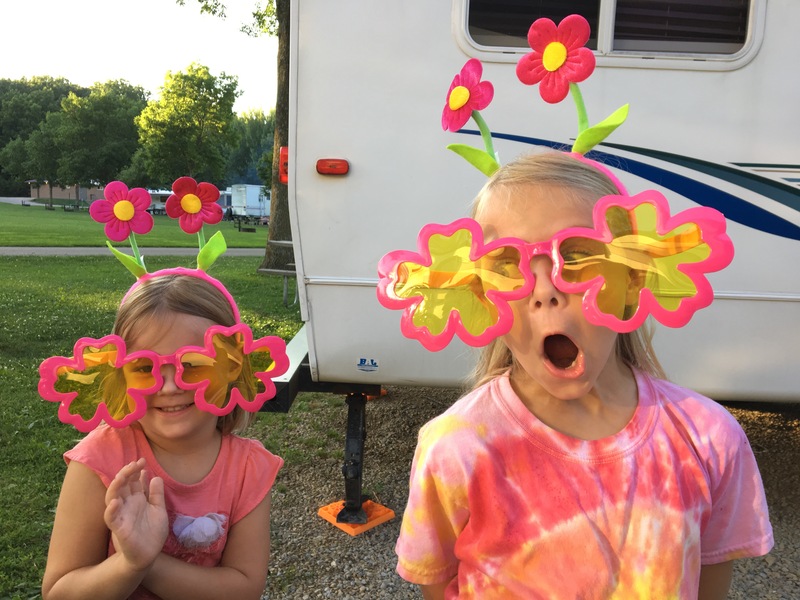 We let the girls stay up late, running on brownie fumes, to catch a few of the hundreds of blinking lightning bugs at the campground. 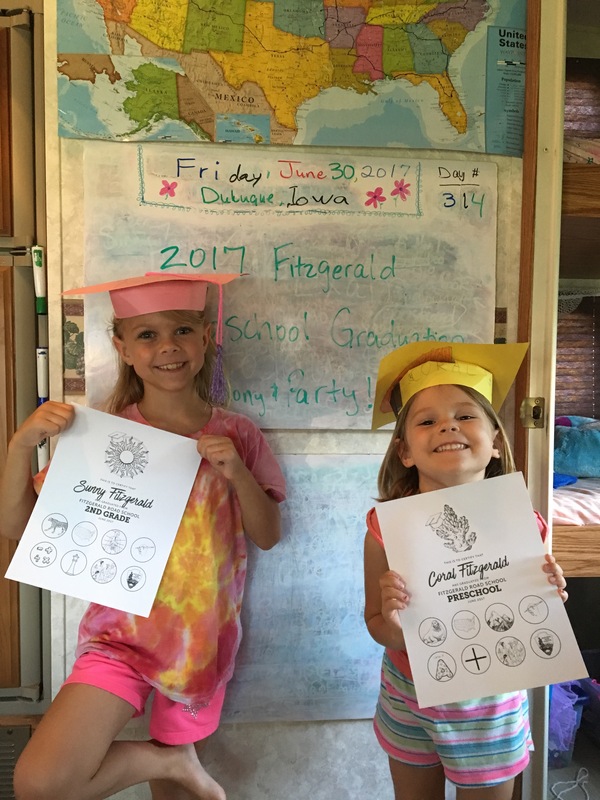 Our proud little Road School Graduates. 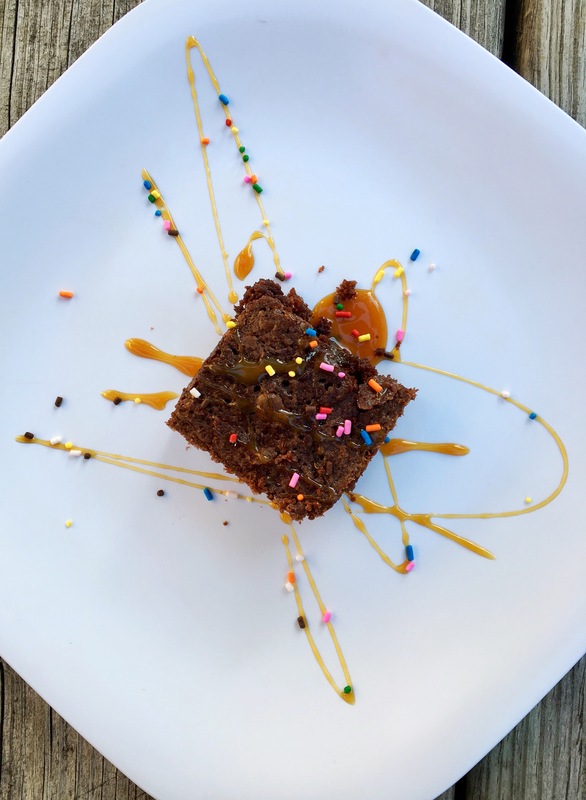 No celebration is complete in my book without….brownies! Thank you for the fun graduation gifts, Miss Tina! 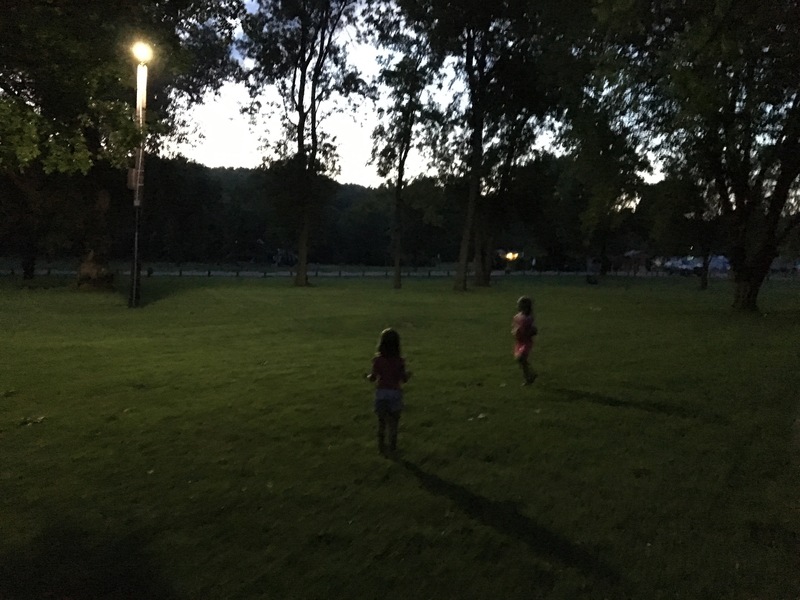 Chasing fireflies on a warm, humid night in Iowa. On our last day there, a new neighbor backed their RV into the spot besides us, and behind the wheel…was a woman. I considered calling Don back in Indianapolis to let him know I wasn’t the only woman who can do such things. Instead I just introduced myself to her and gave her a high five. Planning on going full time within the next 12 months. This blog was an inspiration. Building up my courage.